Here’s a teaser trailer for our upcoming animated series. Will have more details in the coming weeks. Be sure to check out our show with The Brothers of Alien Rock and The Moonmen From Mars on July 8th at Hourglass Brewery! 0 It’s a Cartoon. It’s a Music Video. It’s DEPRESSURIZATION! 0 The Killer Robots! at Monsterween 2016! Real Radio 104.1 and The Monsters present Monsterween, a Voodo Party at The Orchid Garden (126 West Church St., Orlando, FL 32801). The Angel of Boom will be spinning the tunes and The Killer Robots will be performing (9:15PM)! $20 gives you VIP status with food, drink, early entry and a meet and greet with The Monsters. 1 The Killer Robots! Crash and Burn on DVD and Blu-Ray! 0 Action On Film Results! Congrats to the winners of the 2016 Action on Film International Film Festival! We are honored to have been included and nominated in 4 catagories! 1 The Killer Robots! AOF Nominations! 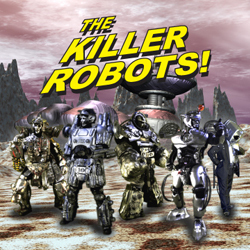 We are very excited and honored that “The Killer Robots! Crash & Burn” has been nominated at this year’s Action On Film international festival (www.aoffest.com) for several awards! Best Soundtrack, Best Visual Effects, Best Sound Design, and Best Fight Choreography! We had a great time talking to Russell McLain on his podcast show. Check it out on Radio Random Network or click the photo below to listen. Russell also talks with Hollywood Screenwriter Ramon Fernandez about his latest documentary Glory Daze. We show up about 20 minutes into the show and talk about The Killer Robots! Crash and Burn (available on iTunes http://apple.co/28Ti8XG) along with some behind the scenes anecdotes and musical influences. We even did our best to come up with some advice for aspiring artists. Enjoy! We had a great time on Monsters in the Morning on Real Radio 104.1 this last Tuesday. We got up early, dressed up in the parking lot and surprised Russ and his crew with donuts and posters. They were kind enough to ask us a few questions about the Killer Robots and the our just-released The Killer Robots! Crash and Burn (available on iTunes http://apple.co/28Ti8XG). Thanks gang! 0 Killer Robots on Behind the Pop! We had a blast on episode 41 of Behind the Pop with Bryant and Derek. They review the new Star Trek movie and also talk to us about The Killer Robots! Crash and Burn and other Killer Robots behind the scenes stuff. Click on the image below to check out the podcast!